Robert Kraft, the owner of the NFL’s New England Patriots and one of President Donald Trump’s most prominent supporters in the sport, hit back at the president for his series of controversial comments in recent days calling for the NFL to “fire” any players who protest during the national anthem. 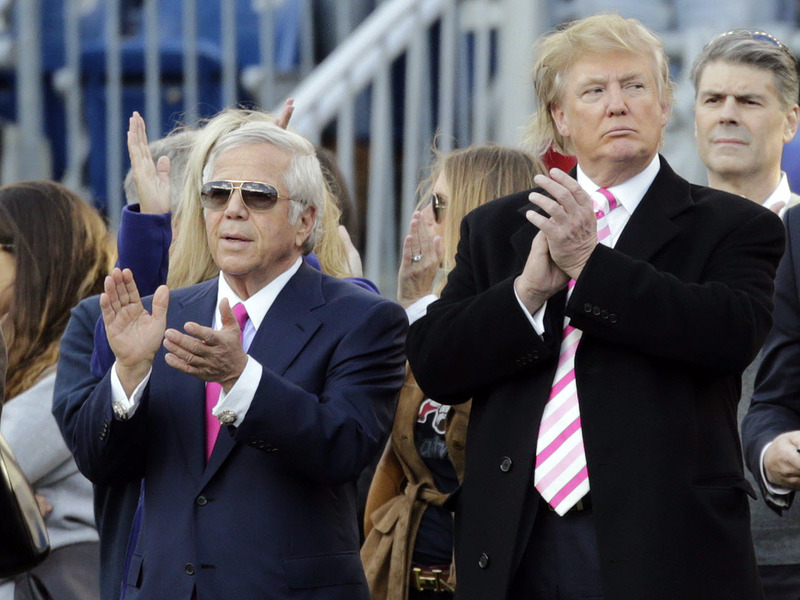 Kraft is one of seven NFL owners who donated at least $ 1 million to Trump’s campaign. Trump frequently bragged of his relationship with Kraft, quarterback Tom Brady, and coach Bill Belichick both during the campaign and following his election, even reading letters of support from Brady and Belichick in the campaign’s closing days. None of the seven owners who donated at least $ 1 million to Trump had publicly condemned Trump’s remarks — which even received pushback from NFL Commissioner Roger Goodell — until Kraft released his Sunday morning statement. Those other owners are Dallas Cowboys owner Jerry Jones, New York Jets owner Woody Johnson, Los Angeles Rams owner Stan Kroenke, Washington Redskins owner Dan Snyder, Jacksonville Jaguars owner Shahid Khan, and Houston Texans owner Bob McNair. Kraft added that he supported his players’ right to protest. The latest Trump controversy began when, at his Friday-night Alabama rally for Republican Sen. Luther Strange, Trump said players who kneel or sit for the national anthem should be fired. A growing number of NFL players, most prominently including former San Francisco 49ers quarterback Colin Kaepernick, have knelt to shed light on the treatment of black Americans in the US. The president then doubled-and-tripled down on his comments Saturday and Sunday, blasting Goodell for his statement and insisting that NFL ratings are declining because of the protests. “Roger Goodell of NFL just put out a statement trying to justify the total disrespect certain players show to our country.Tell them to stand!” Trump tweeted Saturday. “If NFL fans refuse to go to games until players stop disrespecting our Flag & Country, you will see change take place fast. Fire or suspend!” Trump tweeted Sunday morning, just before the day’s slate of NFL games was set to begin.